Arrive at Delhi International Airport. 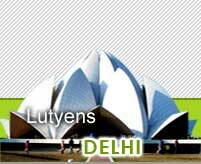 On arrival at Delhi Airport client(s) Will be received by our representative. Later Transfer to the hotel. Morning free to relax. After lunch proceed for half day City Tour of New Delhi visiting Qutab Minar, Humayun's Tomb, India Gate (War Memorial Arch), also drive past Presidents House, Parliament House & Connaught Place shopping centre of New Delhi. Overnight at your hotel. After breakfast we take you for a tour of Old Delhi visiting Red Fort, Jama Masjid & Raj Ghat. Also drive past Chandni Chowk the shopping centre of Old Delhi. Rest of the day is free Overnight at your hotel. In the morning transfer to the airport for your flight to Jodhpur. On arrival transfer to Hotel Ratnada Palace. In the afternoon visit the 15th century fort, which stands on low range of sandstone hills & the magnificent Umaid Bhawan Palace. Overnight at your hotel. After lunch drive to Osiyan Village from where we start the Camel Safari. On arrival introduction to your camels & its attendant. Dinner & overnight at he tents. Osian - It is a small township of 65 Kms from Jodhpur the place is renowed due to the cluster of ancient temples which are scattered on either side of the main road. 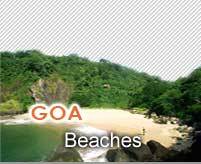 The very approach to this spot is through a few hillocks admist the brown sandy stretch, dotted by scattered hamlets with thatch roof & ochre colour mud walls. After breakfast mount the camels & begin the safari. Packed lunch will be served enroute. After covering a distance of about 16 to 18 Kms we pitch the tents for overnight. Tents are usually located at a distance of 2 Kms from the village. Dinner & overnight at camp. After breakfast continue with the safari. Route - It is all terrain with sparse vegetarian & trees at longer distances. Patches of grass are observed along with bushes. Trees are mostly Khejra (Prosopis Cineraria), which yields manifold benefits to people, cattle & crops in this region. It is an area of zerophytic vegetation. Villages are not in a concentration population pattern. Scattered hamlets are seen, people living by the side of their agricultural farms. Camels & cattle are common sight. Beautiful woman clad in colourful attires add to local scene & attraction. At an interval, on shall find tiny ponds (called Nadi) which are essential for cattle & people. Transformation from traditional to modern life is also seen. Emrpite, you will be guests of Bishnoi village leaders. Their camel can walk with villagers animals led by rural ladies. At village ponds, they can see birds. From camel's back they can observe wild animals like black buck (Antelope cervicapra) & Chinkara (gazella gazella) etc. Night halts can be at advantageous places. Asalty patch will also com under way, Couple of times, one will cross the railway line & roads too. Identification of villages can be done as per convenience. 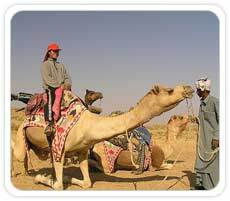 You will observe Bishnoi temples & life around them in utter still atmosphere of desert. On way, migratory cranes can be seen in large in numbers. You will also see Grey Partridge, Quail, Common Sandgrouse, Imperial Sandgrouse, Houbara, Great Indian Bustard, Demooiselle Crane, Peacock are other common species (Great Indian Bustart is a rare spotting). Bishnoi Tribes - It is a sect among Hindus who respect nature, wildlife & lead a life on traditionally proved old scientific values. These people generally wear white clothes & a white turbal to reflect chaste living. They observe 29 principles in daily life, both men & women. These relate to a healthy order of living, including not doing evil practices. The Bishnoi people have earned a high degree of respect & record for themselves by virtue of their extreme dedication to preservation of flora & fauna. There have been four well-documented "Saka" (self-sacrifice) by them in Rajasthan alone-all for saving the desert trees. These people nurse a peculiar strong inhibition towards the killing of Black buck (Antelope cervicapra). To particular Bishnoi, the black buck, any black buck, represents one of his ancestors &, as such, is a object of veneration. There have been instances in recent years of Bishnoi people chasing poachers to an extent that they received bullets on their bodies while protecting the blackbuck. We have seen once a young Bishnoi lady offering her breast to a young one of black buck as it was abandoned by mother near the village, Vishnoiki-Dhani in the desert. These people are hard working, handsome, tall & well built. 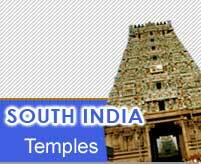 They are hospitable & take pride in upholding their age-old traditions. The Indian desert is picher by presence of this community as most of its ecological balance is largely due to these dedicated men & women. Camp - Swiss Tents lined up. Traditional people receive you as you retire into individual Tents. Outside you see a separate Dining Hall (tented) with table & chairs. Further you find your kitchen (also of tent) & fresh food being cooked for you. In the evening it is time for folk dances, folk songs cocktails & dinner in candle-light/bonfire. Breakfast will consist of fresh fruits, eggs, milk, corn-flakes, bread, butter, jam, marmalade plus other items & tea/coffee. Packed Lunch is to be preferably vegetarian consisting of Parantha (Indian bread), dry vegetables & fresh fruits. Dinner will always be non-vegetarian consisting of one non-vegetarian dish (chicken), two vegetable, lentils, rice, chapatti (bread) & salad, to be followed by & Indian Desert. This day by afternoon we reach a place called Lawan. 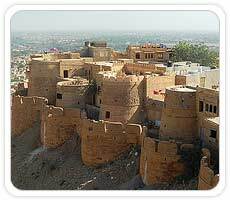 From here Jeeps/Coach will pick you up & drive to Jaisalmer. Rest of the day is free. On arrival transfer to Hotel Narian Niwas. Overnight at your hotel. This morning is free to rest. After lunch visit the hilltop fort & the ancient Jain temples dating from the 12th century. After breakfast drive onto Bikaner arriving in time for lunch at the Lalgarh Palace Hotel. Bikaner was founded in 1488 & like many Rajasthani cities is surrounded by a high battlemented wall. In the afternoon visit the fort & Palace. After breakfast drive onto Jaipur enroute visiting Amer Fort. On arrival transfer to Hotel Overnight at your hotel. After breakfast tour Jaipur itself & see the Hawa Mahal from whose windows the ladies of the palace used to watch the outside world - without being seen. Also visit the City Palace & Jantar Mantar observatory. 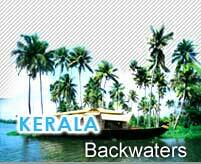 In the evening Gala Dinner & overnight at your hotel. Gala Dinner starts with a Royal Welcome to the group at the Palace which is completely illuminated. Guests are welcomed with decorated Elephants & Horses. Tikka ceremony with garland & shehnai music. 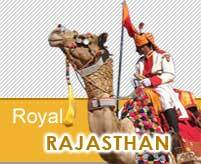 Rajasthani folk dances & folks songs are also organised. All guests are presented with Rajasthani Turbans. Dinner is served in a Royal style with Bar-be-Que & cocktails. In the end there is a spectacular show of fire works. After breakfast leave for Jaipur, stopping en route at Fatehpur Sikri. Arrive at Agra in the evening & transfer to your Hotel . Evening private Magic Show. Early morning visit Taj Mahal. After breakfast visit Fort & Bazaars. In the afternoon drive to Delhi. On arrival transfer.